There's nothing like having breakfast for dinner! I've decided that it could very well be the best part of being an adult. No bed time, no need to sneak veggies to the dog nor any rules about when certain foods can be eaten. Pizza for breakfast? Mashed Potatoes for lunch? Eggs & Hash Browns for dinner? My new favorite BFD (breakfast for dinner) food is baked eggs. I discovered how to make them via my new book: The New York Times Cookbook. I'm sure there will be many more posts about this gigantic book, but the eggs were an easy first try. These are the most delicious eggs that have ever crossed my lips. The end result tastes like a hybrid between a hard-boiled egg and a (not-so) fried egg. 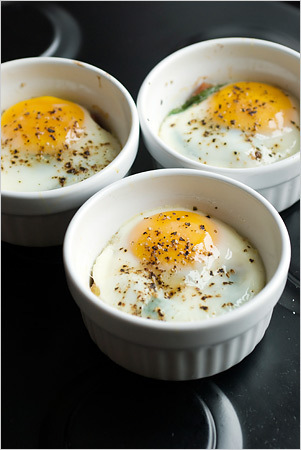 The eggs are pillow-like and creamy, pile them atop a piece of toast! What breakfast foods do you "sneak" into other meals?